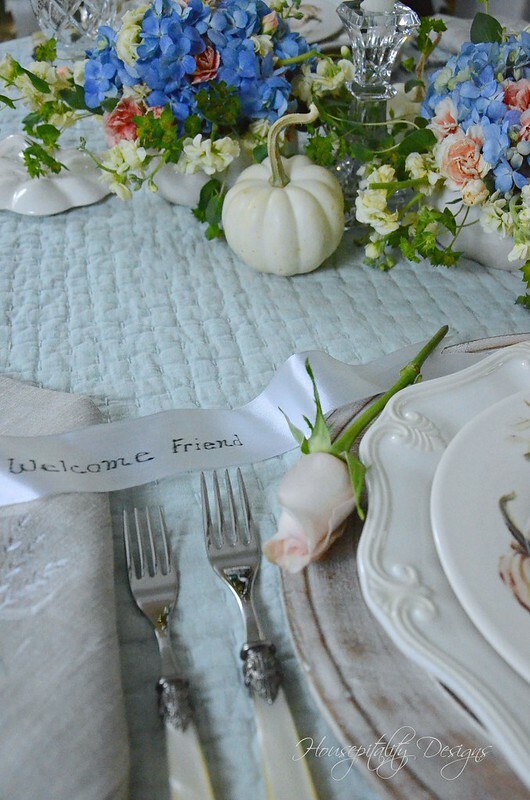 For today’s “party” I set a table for a friend. for their own home and I fill it with flowers. 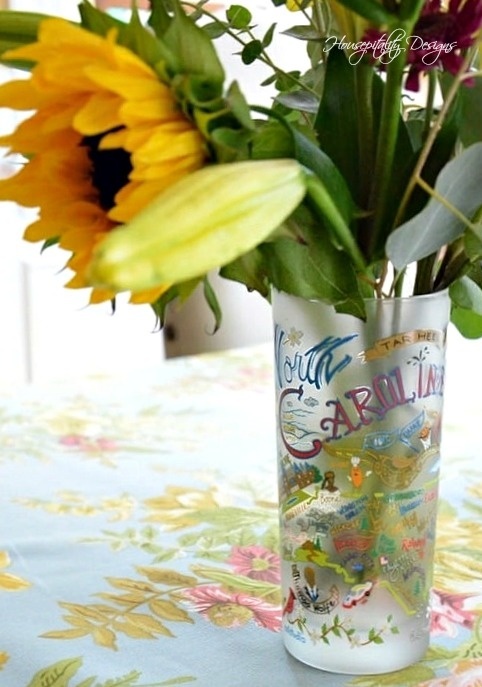 When the flowers have seen their day, then they had a pretty tumbler to keep. Today, the arrangement is done in a ceramic pumpkin with a removable lid. 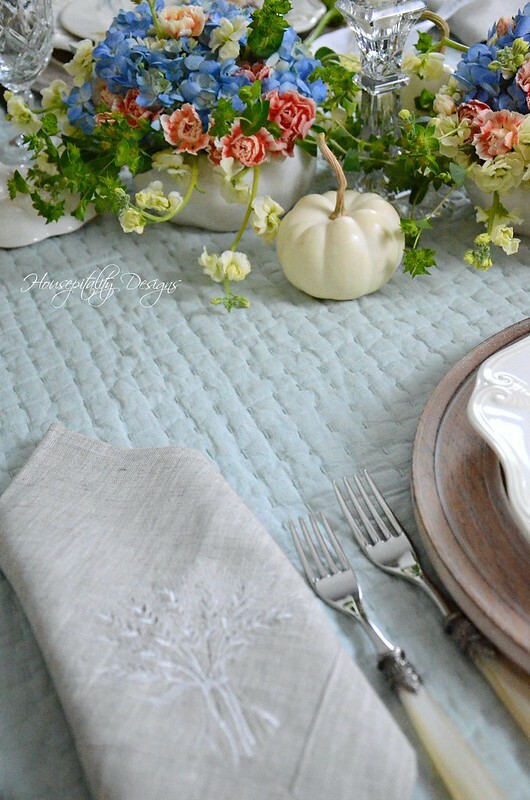 The tablecloth is a quilt (Pickstitch by Pottery Barn). I chose it as it blended to so well with the soft blue in the salad plate. and I saw these beautiful weathered wood chargers from their Southern Living Collection. however, I could only find two chargers with the same finish. Many times the stains and finishes on wood products are different from piece to piece. I purchased two chargers with the thought that I may come across an additional two. had another Dillard’s store. …. how convenient my hubby said! I found two more chargers that matched the original two. 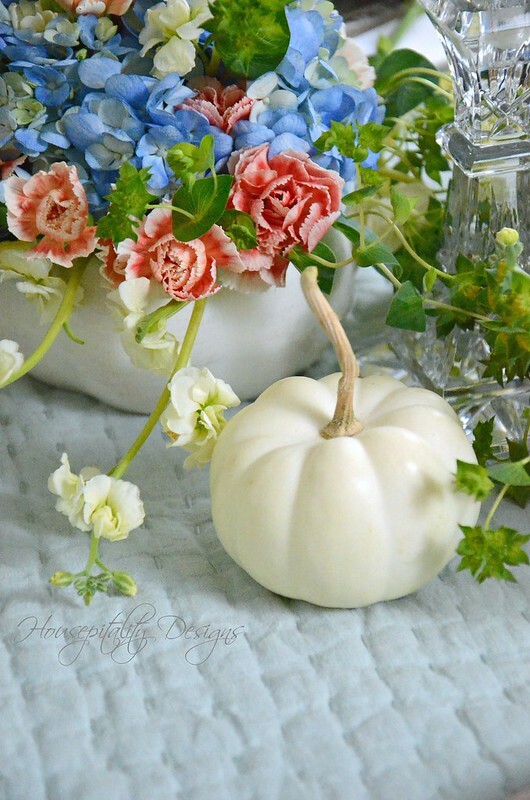 however, the soft colors of the trio of pumpkins looked wonderful with the charger. 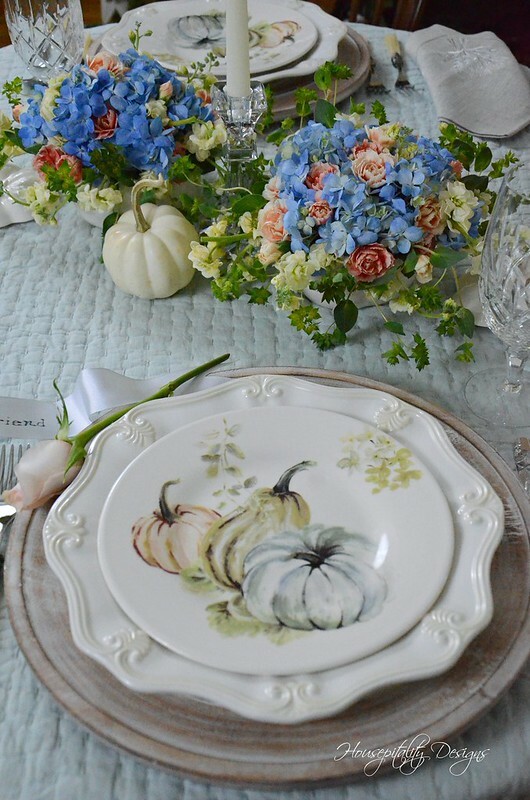 So when I found the two additional chargers, I snagged the pumpkin plates too.
. . . a table in the breakfast area in the Berry Patch House. It has been raining and dreary all week…out came the lighting umbrellas to the rescue. 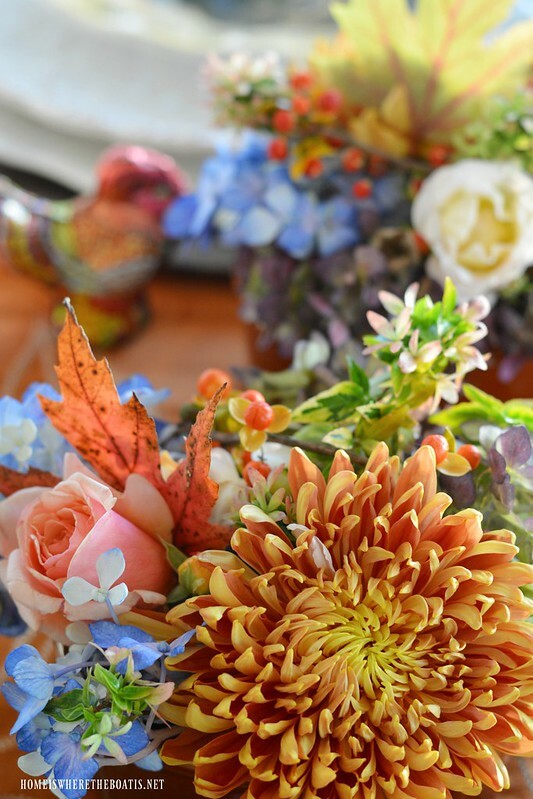 Flowers surely make a dreary day feel bright and happy. white stock, and a lovely green filler that I loved for its draping effect. and the leaves actually grow through the stem as opposed to growing to the side of the stem. 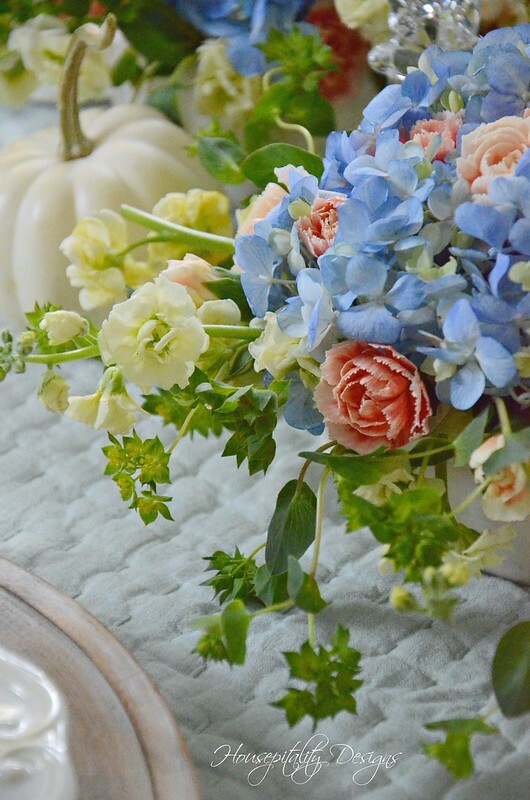 in-between them…thus the hydrangea acting as a lovely base for the other flowers. 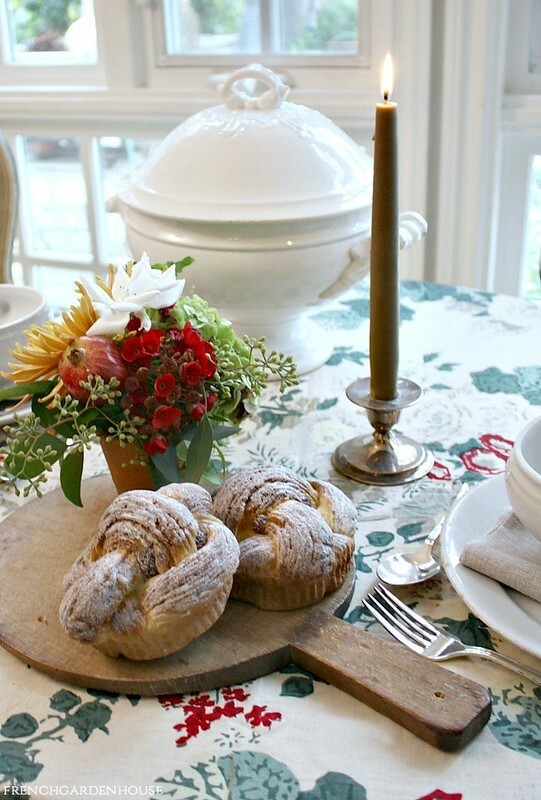 to the breakfast room table quite happily. I believe my Boo Pumpkins lasted well into Spring last year. my beloved Waterford candlesticks were available for special occasions. as every day is a special occasion!! and also love to place in the guest room for guests to enjoy during their stay. Individual Arrangements. Their links are below their beautiful image. And make sure you scroll down to see our big announcement too! And now we come to the BIG ANNOUNCEMENT! 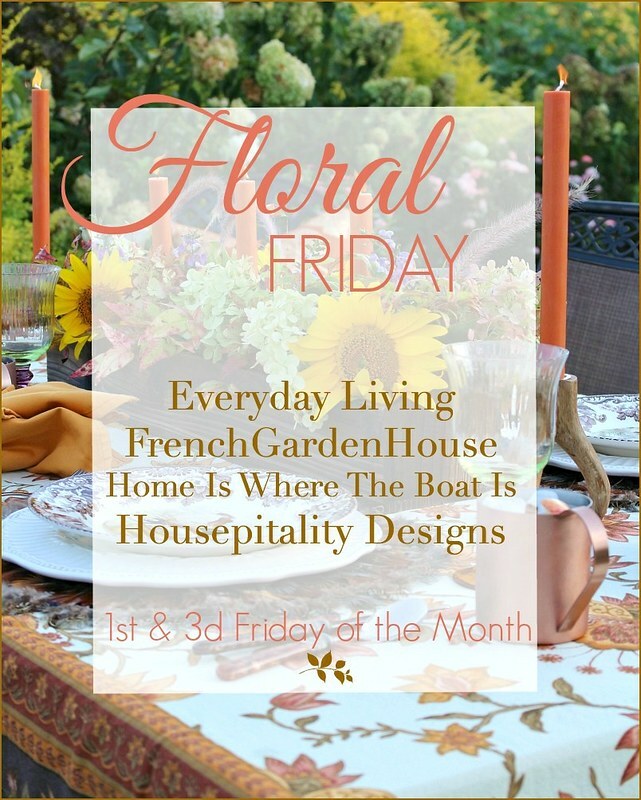 Floral Friday is moving to Mondays! we will have a very special post with a fantastic GIVEAWAY!! So stay tuned for our new venture of MONDAY MORNING BLOOMS on December 3rd, 2018.
will be just as great!! Carol G. ~ ~ Congrats Carol! I wish you all a most beautiful day and weekend!! Just beautiful Shirley! 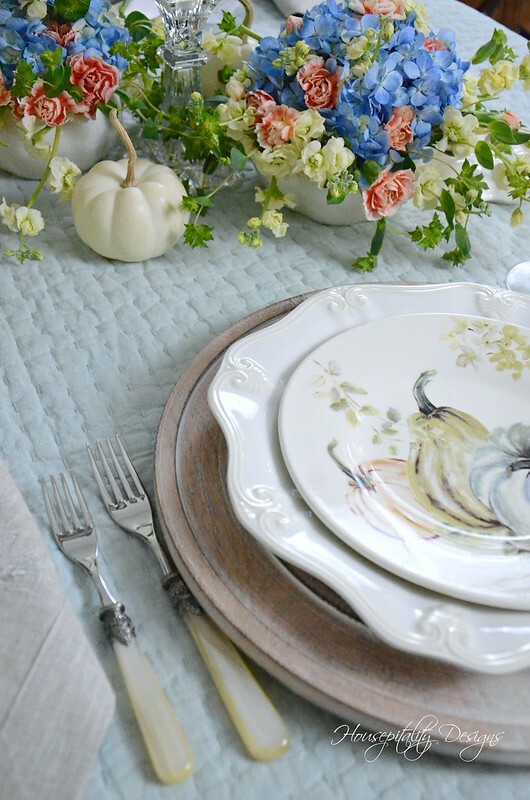 I love every detail from your lidded pumpkin filled with flowers, water color pumpkin salad plates, quilt as a tablecloth and linen napkins. The chargers set your plate stack off perfectly. I haven’t stepped foot in a Dillard’s in over 10 years…looks like I’m missing out! Mary…that is it! Hare’s Ear! …you are the best!….I have 2 plant identification apps on my phone…the ones that you take a photo of the flower/plant and it gives you a list of possibilities…and neither one identified it correctly. I guess I just need to get the “Ask Mary” app! 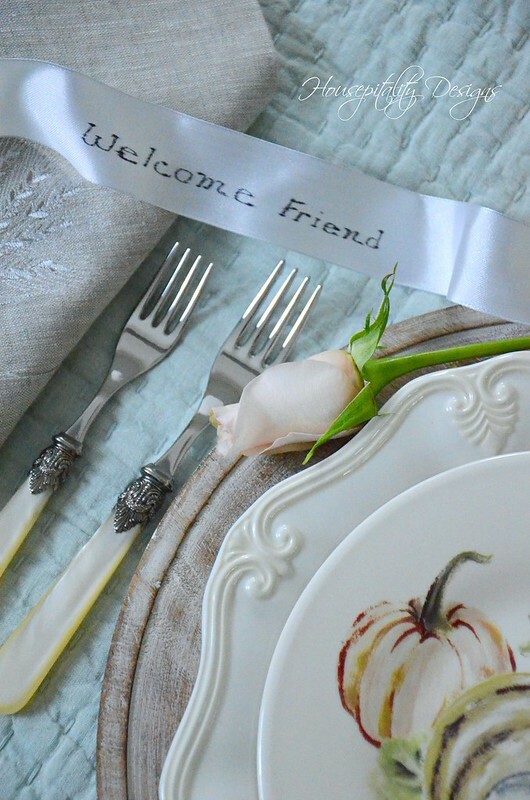 Very pretty and so thoughtful to create a setting for a special friend in mind. I love low-set arrangements, so much more conducive to conversation. Love the addition of your new chargers – I see lots of mileage in using those. Have a wonderful weekend and Thanksgiving, Shirley. Beautiful table and flowers once again. Love that you found more chargers while travelling. Lucky you! You have lighting umbrellas? I didn’t know that. They sure work good. What a beautiful setting! How great you were able to find the other 2 chargers. I love the idea of guest being able to take home an arrangement. 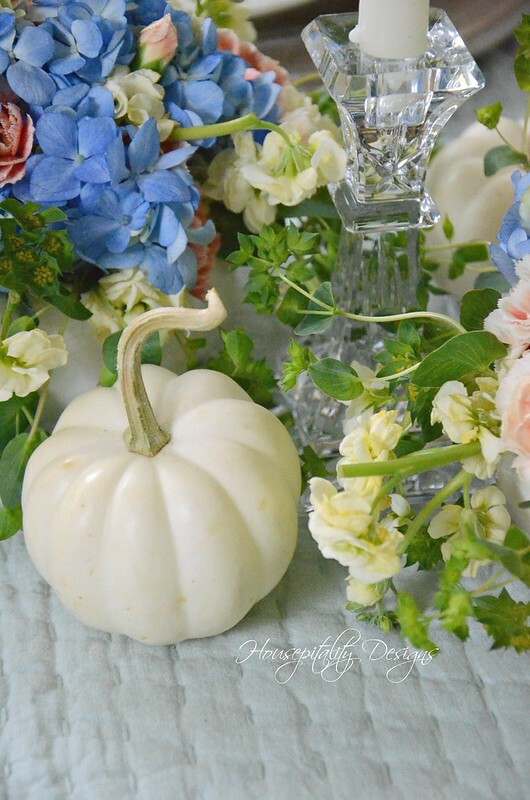 Shirley, how I would love to be that friend that received your gorgeous floral arrangement in that lidded pumpkin. I have a Dillard’s about thirty miles away and I need to get there more often, the chargers are beautiful and I might need to add those to my collection😊. 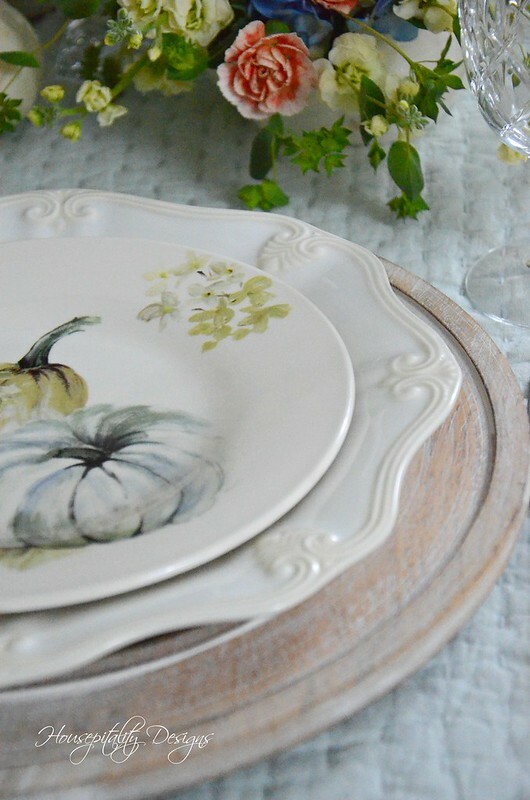 The addition of your new pumpkin salad plates and the gorgeous napkins from FrenchGardenHouse are stunning. Happy Thanksgiving to you and yours. 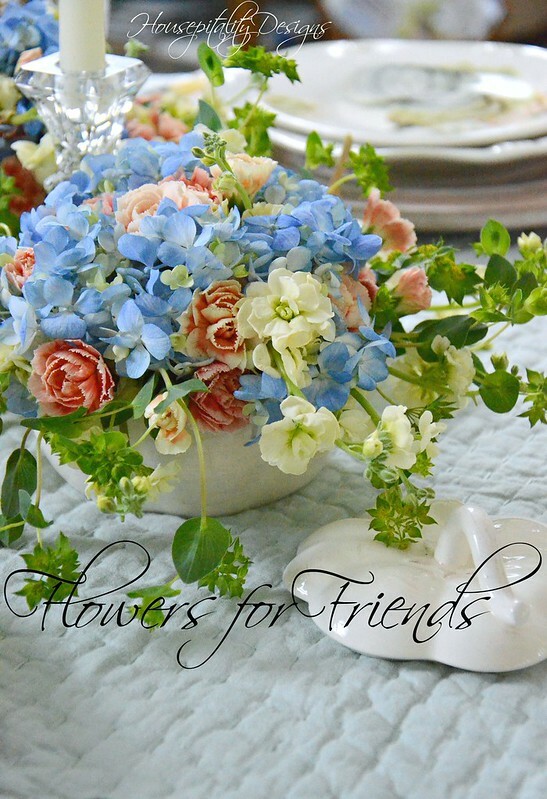 I have loved every Floral Friday that we have shared and I look forward to Monday Morning Blooms! 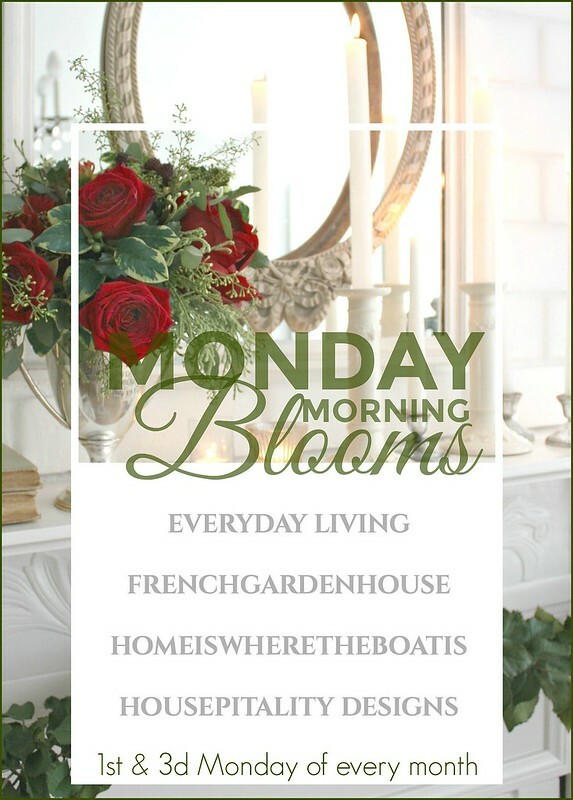 Love the new name Monday Morning Blooms. 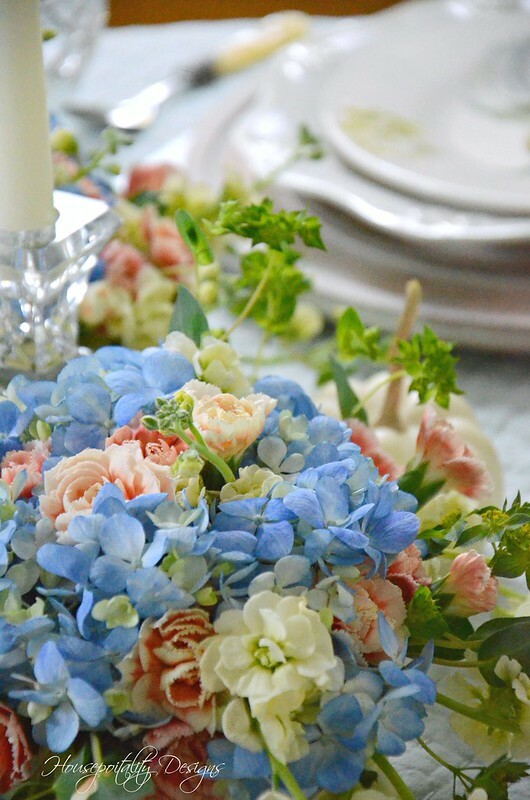 Such a pretty arrangement and like delicate the Hydrangeas look. 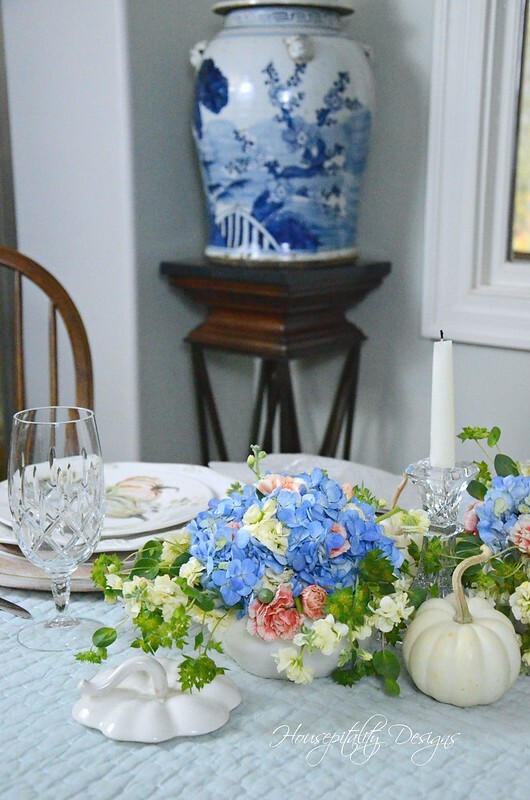 The blue brings out the color in the pretty dishes. I always love them. Oh Shirley I can see why you fell in love with those chargers, gorgeous! I can see those being used in so many ways, I’m so glad you found 2 more! 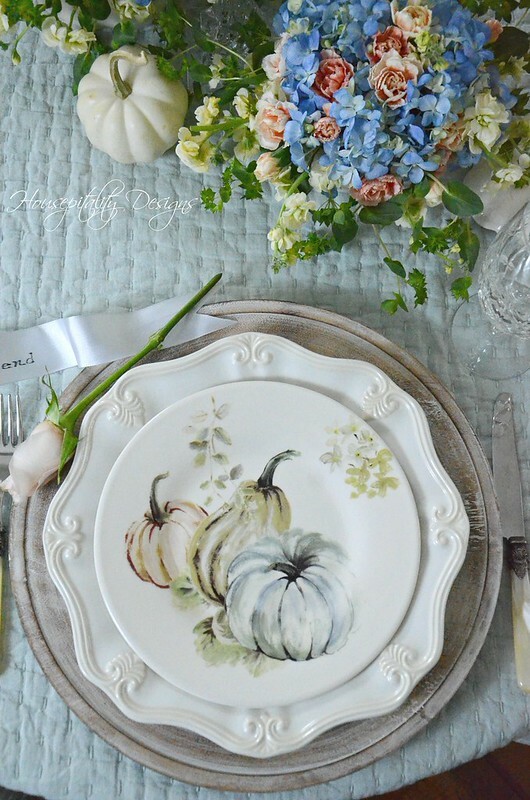 Love the pumpkin trio plates too, what a beautiful place setting! 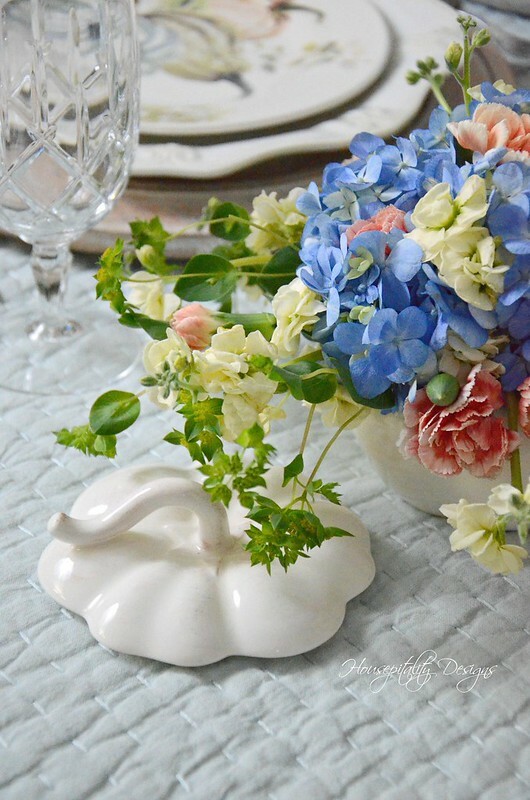 Your mini pumpkin tureens are so perfect and what a lovely treat for your special friend! 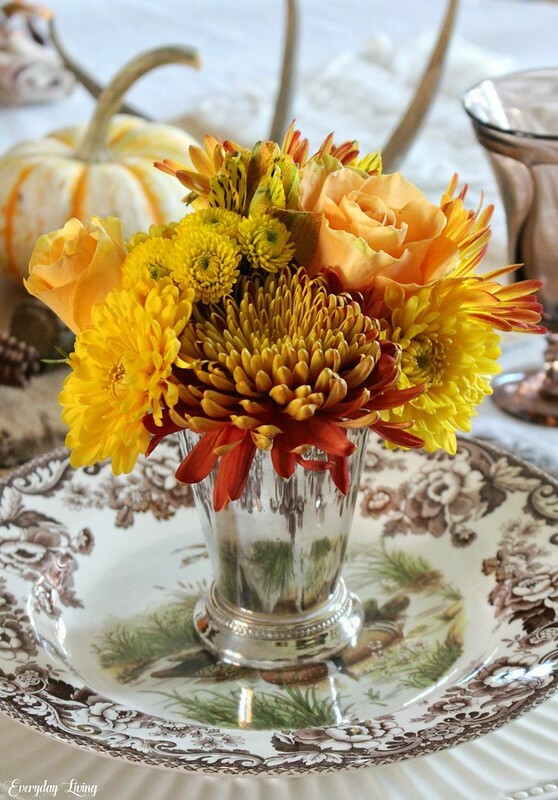 I wish you a wonderful Thanksgiving and I am looking forward to Monday Morning Blooms! Incidentally, I haven’t been able to get on bHome or find it in the App Store. Do you happen to know if it’s still running or if it’s a technical error on my end? Your floral Fridays have been so filled with eye candy. The four of you have done a great job. Hello sweet Shirley. Hope all is well with you and Tom and you are adjusting to the new place. Love the floral Fridays and I really think you missed your calling on workings as a florist. Your designs are so unique and beautiful. Wishing you a wonderful Thanksgiving.